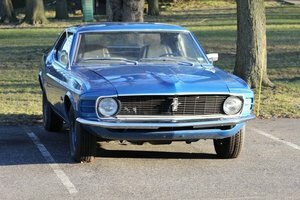 This is an incredible, fully restored 1969 Ford Mustang Mach I. The exterior is red and the paint is excellent. All chrome and trim is sharp and shiny.Interior is the black bucket seat console interior with wood grain accented door panels and dash. Floor mats have the Mustang emblems. Each front seat is accented in red trim. All gauges are new and in excellent working condition.Engine is the 351 Windsor paired with an automatic transmission. Engine has Ford racing valve covers, chrome radiator, and other chrome components. Features are power disc brakes all the way around, power steering, tilt wheel, AC, and a stereo.This car starts, runs and drives with excellent performance. It has always been garaged and has never been driven in the rain. 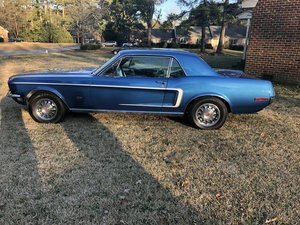 This 1969 Ford Mustang Mach I is located in North Carolina.